The Rustic Bistro collection pays homage to the turn-of-the-century theatre broadside. Its distinctive styling and rustic character bring back an era long vanished, of letterpresses cranking out one-at-a-time notices of a coming event. Today's techniques can replicate yesterday's styles, but reproduced on sturdier papers that will stand much better the test of time. Rustic Bistro's banners, flecked and slightly chipped, their ruled shadows also flecked and slightly chipped, the rustic fonts, and the kraft paper look with flecks and fibers, bring back a time and place of long ago when things were hand made. Also appearing here in a cameo performance is the Banknote font with its shaded and ruled interior, which also helps to set the stage. An antique and rustic style. 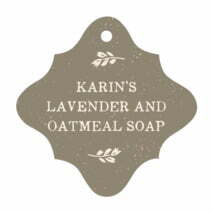 Customize your Rustic Bistro tags today! These Rustic Bistro favor tags are printed on extra-thick cover weight white paper and come in a variety of shapes and sizes (diamond, circle, heart, square, scallop-edged circle, ovals, and other more intricate shapes). The Rustic Bistro favor tags come pre-punched with a small round hole to thread your choice of tie material. They are punched out individually and packaged as a set in small bags. At Evermine, we've put a tremendous amount of thought into our packaging, material quality and lovingly created designs to make all your products and gifts perfect. Have fun personalizing your Rustic Bistro favor tags today!